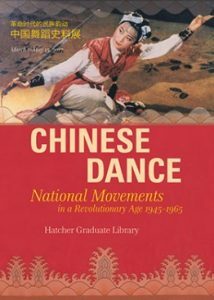 The University of Michigan Lieberthal-Rogel Center for Chinese Studies and the University Library are pleased to announce a new exhibition, Chinese Dance: National Movements in a Revolutionary Age, 1945-1965, to be held March 1-May 15, 2017 at the University of Michigan, Ann Arbor. Featuring materials from the University of Michigan Library’s Asia Library, home of North America’s largest collection of research materials on Chinese dance, the exhibition introduces modern Chinese dance history during the period from 1945 to 1965 through digitized photographs, performance programs, archival materials, books, and videos. The exhibition is co-curated by Emily Wilcox (U-M Department of Asian Languages and Cultures) and Liangyu Fu (U-M Asia Library) and co-sponsored by the U-M Lieberthal-Rogel Center for Chinese Studies and the University Library. Join us for an opening reception at the Hatcher Gallery on Monday, March 6, 4-5:30 pm. The U-M will also be hosting a conference Dancing East Asia: Critical Choreographies and Their Corporeal Politics on April 7-8, 2017. For more information, please contact Emily Wilcox (eewilcox@umich.edu). Posted in Dance	Bookmark the permalink.